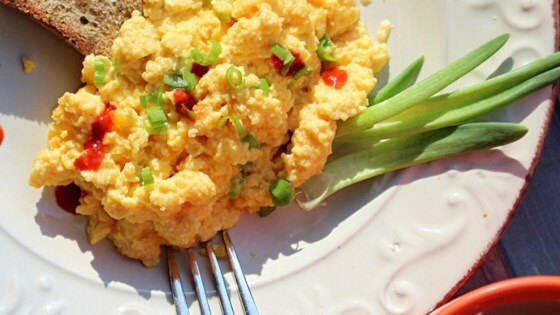 "Creamy scrambled eggs with chives and goat cheese create an earthy flavor that will bring you to the farm. A dash of sriracha is your bus ticket home if you need it. Serve with your favorite toast, and since you are there, a slice or two of bacon." Whisk eggs, half-and-half, salt, and pepper together in a bowl. Whisk in goat cheese and chives. Melt butter in a skillet over medium-high heat. Pour in egg mixture; cook, stirring occasionally, until set, about 5 minutes. Transfer to serving plates; draw a line down each plate with sriracha sauce. I added pesto very good I have always used milk ..like the half and half little richer . Yummy! Very fluffy. Would add less salt next time. I didn't add the goat cheese and I used bottled chives instead. I liked it the way I did it and I hope you guys can try it too!